Toishi castle (砥石城) is located at a long and narrow ridge of 200 meter height from hillside, prolonged from Higashitaroyama mountain at the north of Ueda city central. 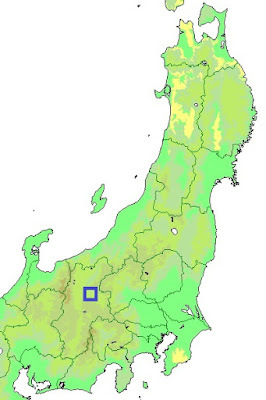 Castle site is at the end of line of mountains spreads from northwest to southeast along with Chikumagawa river, from the south end of Nagano basin to the west end of Ueda basin. At the same time, also it locates at the side of the valley formed by Kamikawa river spreads toward north from Ueda city, which was the original territory of Sanada clan. Precise year is unknown but Toishi castle might be built in 15th century. The small valley of 3 kilometer long and 2 kilometer wide is called as "Sanadanosho", and had been the native place of Sanada clan. The origin of Sanada clan is unknown but said as a branch family of Unno clan, a group of clans spreads at the eastern part of Shinano province (Nagano prefecture). During 15th century Sanada clan gradually grew into a local lord of the valley, and built castles around the valley including Toishi castle. But in 15th century, Sanada clan faced a critical moment. At that time strong lords surrounded Sanada clan such as Takeda clan, the governor of Kai province (Yamanashi prefecture), Suwa clan which was the priest of Suwa Shrine and lord of Suwa region, and Murakami clan which seized south part of current Nagano city and Sakaki town, grew into warlord and started to expand. In 1541, these three clans allied and attacked Unno clan, and being overwhelmed Sanada clan lost their territory along with Unno clan. Yukitaka Sanada (1513-1574), the leader of Sanada clan, defected to Yamanouchi Uesugi clan which was the governor of Kozuke province (Gumna prefecture) across Usui Toge pass, preparing for recovery. After this battle, territory of Sanada clan was seized by Yoshikiyo Murakami (1501-1573), the leader of Murakami clan. Murakami clan was originally a descendant of Minamoto clan, which was the same family of Kamakura Shogunate. They had a long history since the advance of Yoshinaka Minamoto (1154-1184) toward Kyoto city, and activated at the overthrow of Kamakura Shogunate by Emperor Godaigo (1288-1339). Murakami clan was nominated as the leader of local lord of the province, but at the internal conflict between Emperor Godaigo and Takauji Ashikaga (1305-1358), the founder of Muromachi Shogunate, Murakami clan. In Muromachi era, Muromachi Shogunate appointed Ogasawara clan as the governor of Shinano province, but this province was separated into basins by mountains then Ogasawara clan could not establish uniform dominance. Because of the position of the leader of local lords, Murakami clan lead other local clans and resisted to Ogasawara clan, thus the reign of Ogasawara clan was limited to Matsumoto basin. Since the latter half of 15th century, Murakami clan grew their power and conflicted with neighbor local lords such as Unno clan or Takanashi clan, and spread their territory. As above in 1541, Murakami clan broke Unno clan and Sanada clan thus seized Sanadanosho area and Shiota area at the south of Chikuma-gawa river, which was traditionally the center of Shinano province. As a front fort of their main base Katsurao castle (Nagano prefecture), Murakami clan expanded Toishi castle into a large mountain fort. Toishi castle consists of four forts spreads along with the ridge, it mean Yoneyama fort, Toishi fort, Main fort and Masugata fort from south. Yoneyama fort is a front fort at lower peak and has several terraces around the peak. As this area is at the edge of the ridge, southward of Toishi castle including current Ueda city and Chikuma-gawa river is well seen. Now climbing route from hillside reaches at the saddle between Yoneyama fort and Toishi fort. Toishi fort is a small round shaped fort at a higher point, and it seems like a watching tower. Backside of the fort is protected by sheer clay wall, and a long flat area is built at the saddle toward main fort. Main fort is built at the highest point of the ridge, including several large flat terraces. There might be a residence of the lord at the highest terrace, and front wall of this point is decorated by stone wall. Masugata fort is built at a small peak at the north edge of the castle, connecting to backside ridge. This was a defense point to protect enemy attack from backside mountain, and also used as a watching place toward northwest. Total size of the castle reached over 500 meter, and even though lacking progressive defense facility, its natural shape with cliff wall had sufficient strength. But just after the fall of Unno clan, Murakami clan itself had to face the attack of Takeda clan directly. Shingen Takeda (1521-1573), new leader of Takeda clan, aggressively attacked Shinano province, ruined Suwa clan in 1542 and captured Suwa providence. Next Shingen intruded into Saku region and captured it after a fierce battle by 1547. Now the territory of Murakami clan and Takeda clan adjoined at Ueda area. In 1548, Shingen lead large army and advanced into Murakami territory, and Yoshikiyo Murakami intercepted at the western part of current Ueda city. Shingen forcefully attacked to Murakami army and broke its vanguard, but Yoshikiyo who was known as a brave general made counter attack to Takeda army dropped their guard and broke them. Shingen suffered severe defeat and lost his two veteran general Nobukata Itagaki (1499-1548) and Torayasu Amari (1498-1548) along with many soldiers. But Shingen did not give up expansion and quickly restored situation. In 1550 Shingen ruined Ogasawara clan at Hayashi castle and captured Matsumoto area, to fix the backside. Just after that Shingen siege Toishi castle with 7,000 soldiers in September 1550, to suppress local lords under Murakami clan from backside. At this time Yoshikiyo left Toishi castle and attacked Takanashi clan, then there was only 1,000 soldier at Toishi castle. However, Toishi castle was a secure fortress and Murakami army stood the siege of Takeda army over two week, and hearing this news Yoshikiyo promptly made peace with Takanashi clan and returned to Toishi castle. Takeda army fell into interior situation gave up and tried to retreat, but furious Yoshikiyo fiercely chased Takeda army and gave serious damage. Takamatsu Yokota (1487-1500), who served rear guard of Takeda army, died in the battle. This defeat is called as "Toishi Kuzure", then Yoshikiyo and Toishi castle showed military fame to the province. But in 1551 May, Toishi castle suddenly fell the plot of Yukitaka Sanada. As their original territory was captured by Murakami clan, Yukitaka served to Shingen and connected to retainers of Murakami clan. As Toishi castle was next to the original territory of Sanada clan, Yukitaka might urge the relative and acquaintances to rebel and open the gate. Even though Yoshikiyo broke Shingen two times, Shingen's power exceeded Yoshikiyo and this plot succeeded to admiration. The castle stood might of Takeda army fell by plot of Yukitaka too easily. Yukitaka who seized Toishi castle aggressively recruited retainers of Murakami clan. Facing the pressure of Shingen, many retainers of Murakami clan changed to Takeda clan then Murakami clan which was proud of its military power internally collapsed. Finally in 1553 Murakami clan could not keep their main base Kazurao castle then escaped to Kenshin Uesugi (1530-1573), the warlord of Echigo province (Niigata prefecture) and fatal enemy of Shingen. Now Shingen wholly captured middle part of Shinano province but this was the beginning of long battle against Kenshin Uesugi. Yukitaka Sanada and his son Masayuki Sanada (1547-1611) activated under Takeda clan under their intelligence and tactics, then became the commander at Ueda area and western part of Kozuke province such as Iwabitsu castle or Numata castle. After the fall of Takeda clan in 1582, Masayuki Sanada survived turbulent situation among strong powers such as Hojo clan, Uesugi clan and Tokugawa and became an independent warlord. In 1584, because of the territorial dispute of Numata area, Ieyasu Tokugawa (1543-1616) attacked Masayuki Sanada at Ueda castle which was newly built as a main base of Sanada clan just south of Toishi castle. Masayuki placed his eldest son Nobuyuki Sanada (1566-1658) as a detached army at Toishi castle, and made backside attack to Tokugawa army which siege Ueda castle. This plan well worked then Sanada army with 2,000 soldier broke Tokugawa army had 8,000 soldiers. Finally Sanada clan became a feudal lord under Toyotomi government, and Toishi castle might be kept as a backup castle for Ueda castle. In 1600, at the conflict between Ieyasu Tokugawa and Mitsunari Ishida (1560-1600) after the death of Hideyoshi Toyotomi (1537-1598), Masayuki Sanada and his second son Nobushige Sanada (1567-1615, famous as Yukimura Sanada) belonged to Mitsunari and again fought to Tokugawa army lead by Hidetada Tokugawa (1579-1632) at Ueda castle. This time Tokugawa army feared backside attack from Toishi castle and captured it in advance, but Masayuki rejected the attack of Tokugawa army at Ueda castle again and let Tokugawa army behind time of the outbreak of main battle at Sekigahara. After the battle Sanada clan could continue by Nobuyuki Sanada who belonged to Ieyasu, but Toishi castle might be abolished at this time. Now all building was lost but shape of terraces well remain over the hill. From the top of the hill scenery of Ueda area is clearly seen, along with the memory of lords and generals attacked and defended this mountain fortress. 20 minutes walk from Iseyama bus stop of Ueda bus from JR East Hokuriku Shinkansen line / Shinano Tetsudo line Ueda station. 10 minutes drive from Joshinetsu-Jidoshado Expressway Ueda-Sugadaira interchange to hillside parking. 40 minutes walk from hillside entrance to hilltop castle.